I got to Knoxville in preparation for the #10 Vols to take on #23 Ole Miss in a key early-season hoops battle. When I got there, it was a circus. But a funny thing happened under the big top, the new ringmaster showed up and cooled everything off. Tennessee AD Mike Hamilton was serious (just look at his face) when he said he wasn't returning back to campus without a head coach. And when Louisiana Tech Head Coach Derek Dooley was introduced, Vol Nation was skeptical to say the least. 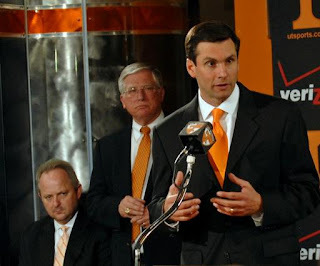 But Coach Dooley was extremely impressive and composed, and a further look at his resume shows that the Tennessee program may be in good hands for a very long time. 1. He was Recruiting Coordinator for Nick Saban at LSU, which included the 2003 National Championship. 2. He was not only the head football coach at Louisiana Tech, but athletic director as well. So not only does he know how to recruit, but knows a little something about compliance. Not to mention strong organizational and time management skills. 3. He's his "own man." After the previous head coach left for his "dream job," how does someone whose name is synonymous with Georgia football, convince the Tennessee fan base that this is his "destination." Again, look at the resume. When he went to college, he could have flown into Athens on a magic carpet, but he decided to walk on at Virginia instead. When he returned to Georgia, it was to continue his education. After 4 years of law school and 2 years as a practicing attorney, that's when he decided to get into football coaching. After working for Saban with the Dolphins, he could have taken a high-profile assistant position at Alabama, but decided to step into the unknown in Ruston, Louisiana and move the La Tech program forward. At Dooley's press conference, he said he couldn't sum up his goals in a soundbite. He wouldn't make any promises he couldn't follow through on. He said trust couldn't be asked for, it had to be earned. Lane Kiffin grabs attention as wonderboy, and he still might be - the jury's still out. He hasn't been anywhere long enough to find out. Dooley is just 41, and his grades are incomplete as well. But he seems to have pockets full of character. While Kiffin plays pirate, Dooley is more like a president.